Coaches are always looking for big guys who have some versatility to their games, but understand how to operate inside and control games in the trenches. 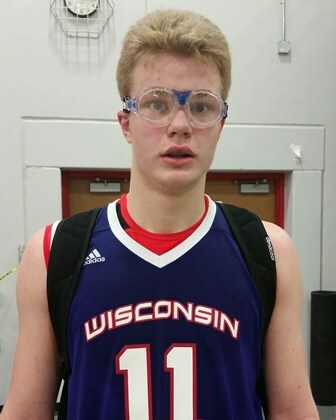 In Green Bay, one of Wisconsin’s promising bigs coming up in the 2018 class right now is post prospct Jack Plumb. With his great size, mix of skill and ability on both ends of the floor along with a high motor, the future looks extremely bright for Plumb and should have coaches clamoring to get a look at his game more soon. Plumb is a 6-5 forward with great build for his age. His frame looks to still be developing to where the 8th grader will be able to put on more bulk as he goes through high school without drastically changing the way he plays, as he already operates with a 195-200-pound body. With his size now, Plumb is a tough athlete who works non-stop throughout games, often out-hustling opponents and running the floor both ways to give his team the best advantage possible. Offensively, the talented forward elevated his game immensely this past year and has rounded out some aspects to skill-set to make him more difficult to defend. Plumb can score from any level on that end really, showcasing an ability to knock down outside shots better lately which is impressive for a young low post-type player as he also is. Plumb is devastating for opponents to defend inside one-on-one as he already has a few post moves in his arsenal, he has a solid little baby hook shot and attacks the rim when he turns on the defender instead of falling away from contact like many young players tend to do. Plumb has also showed the ability to knock down some tough mid-range level shots. Furthermore, for his size, Plumb handles the ball alright and has even brought it up the floor at times in tournaments, especially when he sees the opportunity for a fast-break whether off a steal inside or longer rebounds, etc. He showed good body control in such situations and as his passing game develops consistency, he will have more success when playing on the wing and such. On defense, Plumb is a force because of his activity and his heart. Plumb is a fierce competitor and knows he can change games with his defense and rebounding perhaps even more so than he can scoring the ball on the other end. Plumb uses his body well against posts, but because of his athleticism and decent footwork he can extend out and put some pressure on other versatile opponents. Rebounding though is really where Plumb can hang his hat though as he exerts himself greatly on the boards and is almost a sure double-double player game in and game out whenever he hits the court. Plumb is an exciting player to watch because he seems to get better with each game and his passion for basketball is fun to witness. With his development continuing physically and the way he continues to elevate different areas of his game, there is large reason to believe Jack Plumb will find great success at the high school level and should garner lots of attention from college programs in the coming years. Plumb played with the Green Bay Storm program this past winter and he is expected to take the court with the newly formed Wisconsin United program this spring and summer.